There's something in the water. All of a sudden there's news of rockstars retiring in a disturbing number in the starting weeks of this year. Wo. noticed the pattern and started a conversation under the title: Something new, yet slightly worrying. Inevitably there's some reminiscing involved of better things. There is another sort of news that is somewhat worrying and around a lot in the 5 weeks this year is old. Farewell tours. First Neil Diamond had to stop his tour due to dementia. 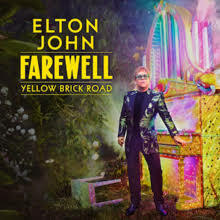 Somewhere around that date Elton John announced a, three year, farewell tour. I already saw the posters up along the roads announcing a show in big letters, golden coloured, saying "FAREWELL". Then Slayer announced its final tour, definitely a younger generation, so it can always comeback. 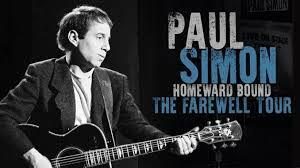 Yesterday a show by Paul Simon was announced in the newspaper: 'Homeward Bound. The farewell tour". We are saying goodbyes in more ways than we thought just a few weeks ago. This is about ending a career, by people who have entered their seventies (plus). Or at least their live playing days. Now I'm not a big fan of either of the four, although three of them have their moments, with Paul Simon liked best by me. It means that more will follow and probably sooner than later. It is not a taboo to actively end a musical career. But in general, we must expect the inevitable for our heroes and idols, eventually they will all become too old, infirm, ill to perform, write or record. The unpalatable truth is that they will ALL eventually die. In recent year the deaths of Emerson, Lake, Bowie, Rick Wright (this list is not exhaustive have brought closer the realisation that my era of music is passing… Where before the deaths of people like Hendrix, Joplin, Paul Kossoff through drug abuse was tragic but understandable, and later artists passing like Freddie Mercury because of illness. But now our heroes are dying… from old age! It is the way of the universe and although no matter how tragic, bleak and uncomfortable this truth is… I know I must be thankful that I lived through such an amazing period of great music. I believe I am so lucky to have been born in the late 50s and to have been old enough to see and hear the great artists, bands and music of the 60s and 70s. I feel sad that my children are unlikely to be able to experience the kind of musical creativity that I took for granted…. Indeed, it seems that the younger generations do not enthusiastically relate to music in the same way that our generation did? I hope that future generations will rediscover the music of the 60s and 70s much like today people are rediscovering jazz, big band, folk and classical music? I refuse to believe that such a wonderful period of innovation and creativity will be forgotten? Well the good news on my end is that, my son is an even bigger Beatles fan than I am. And my two youngest step sons love to go to The Analogues shows with me as a birthday present and got to know The Beatles first mostly through my son who made them a compilation for in the car during a holiday. Now my son certainly is not an example for his age group. The good thing about raising him on lots of good music is that he has bought me a ticket for the first time. We are going to Franz Ferdinand next month in his new hometown. BTW I got the new album today and it, again, is great. What I notice about the youngsters in my life is that they listen to everything. From the latest rappers and stuff, to things like Steve Miller Band or just as easily sing along to a very early Stones hit. What I am not sure of is whether they appreciate music the way we did. They have everything one click away. We depended on many factors to be able to hear something and sometimes never heard a song again for years. It was just something in my mind until I found a second hand copy decades later. What we had was valued a lot more and to get an album that you did not like, was nothing short than a disaster as we had to wait until the next special occasion before we could ask for the one we did want. I just listened to a Stones greatest hits compilation over dinner, nearly all songs we heard were from around 1965. I could sing along to every song, like I can for 40 years or more, but so could the stepkids to some of them. Even Gimme Shelter. So yes, it's different, but I do think they will find out what they really like if they haven't already. There is just so much to distract them from music and their money goes into games. They don't own a single record. My son does, but I think they were all presents. Now he's earning money, perhaps this will change. I'll ask him when I visit his home. In the meantime we just have to wait who retires next, voluntarily or not. Not me I hope. We just played 'Come Together' for the first time and did that feel nice. A blues cover from a blues cover is up next: 'It's Your Voodoo Working'' by Eilen Jewell. This week I read that Lynyrd Skynyrd is embarking on its farewell tour in the U.S. this May.